For the rest of the week, I will be posting elegant evening wear every day in honor of New Years. For Today’s B&B paper doll series New Years gown, I wanted elegant, but not glitzy. Something sophisticated and almost Queen like. This is an evening gown for a woman who knows she is amazing and doesn’t need to show off with bright colors or spangles. In keeping with the Royal concept, I chose purple and black for today’s New Years gown. The skirt is in soft pleats and the bodice wraps. Personally, I imagine it in something like taffeta or a thick rich mat satin, but since it is actually made of paper, who knows? 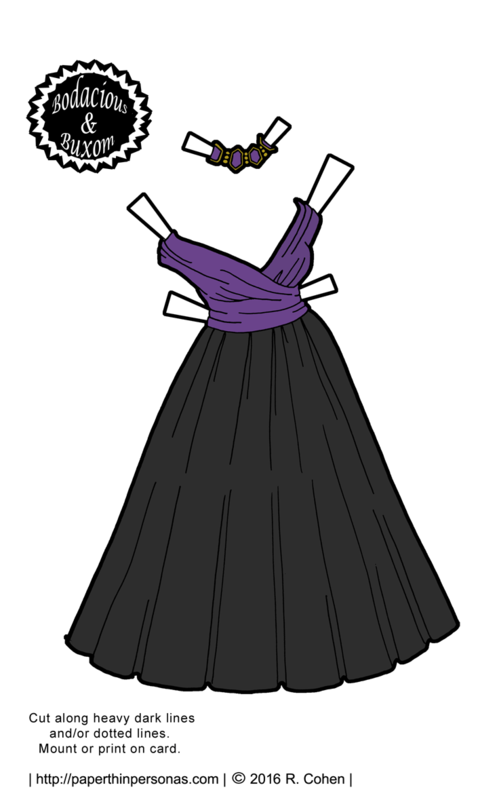 After I drew this, I realized I haven’t really given a lot of evening gown love to the B&B printable paper doll series. I might need to rectify that in the coming year. What say you all? Do I need more B&B evening wear? Like the blog? Than think about becoming a Patron, following the blog on Twitter, leaving a comment, and/or telling a friend about it. More elegant evening attire would be nice to see added to the B&B series. who could ever object to more eveningwear? love the necklace! this is very elegant! The necklace was a last minute decision, but I really like it. This outfit looks not only elegant but classy. Like, you could wear this with family or friends and still like yourself and be liked in the outfit.